Prime Minister Narendra Modi’s maiden trip to the United Arab Emirates (UAE) has led to the Emirati government allocating land for the construction of Abu Dhabi’s first Hindu temple. This move of the UAE government is bound to accelerate religious pluralism in the Gulf nation which is home to nearly 2.6 million immigrant Indians. The Emirati city of Dubai currently has two temples, one of which is dedicated to Lord Shiva and the other to Lord Krishna. These facts introduce us to an altogether ignored reality in certain Muslim majority societies. While we often hear of the bigoted and conservative nature of theocracies and so-called Islamic states like Saudi Arabia, we are mostly unaware of the religious tradition prevalent in other Muslim majority countries. Indonesia, the country with the world’s largest Muslim population, is a secular nation. The Indonesian constitution is planked on the philosophy of “Pancasila” which is pluralistic in its outlook. The drafting committee of the constitution categorically decided to replace the word “Allah” with “Tuhan” so as to ensure that the minorities in Indonesia did not feel neglected and all communities could relate to the phraseology of the constitution. Indonesia’s national carrier is called “Garuda Indonesia” whose name has been inspired by Hindu mythology. Garuda is the steed or “vahan” of Lord Vishnu. In fact, the Garuda Purana details the conversation between Lord Vishnu and Garuda. Some of the Indonesian currency notes carry pictures of Lord Ganesha and it is a common sight to come across statues of Lord Krishna, Arjuna and Ghatotkach while paying a visit to the Main Square in Jakarta, or the city of Bali. There are examples from many other nations which can be recounted. Foremost among them is Turkey, which was built on the lines of fundamentalist secularism by none other than Mustafa Kemal Ataturk. Ataturk brought in sweeping secularisation measures and cultivated the notion of Turkish nationalism. Lebanon is another mutli-faith country where the law mandates equality between Muslims and Christians. Following their independence from the erstwhile Soviet Union, the Central Asian nations of Kazakhstan, Kyrgyzstan, Turkmenistan, Tajikistan and Uzbekistan, despite their Muslim majority societies, chose to embark on the lines of Leftism and secularism instead of Islamism. The same is the case with Bangladesh. After its liberation in 1971 which effectively buried the dubious theory that Hindus and Muslims were two separate nations, Bangladesh chose to ingrain “secularism” within the preamble to its constitution and decided not to replicate West Pakistan by proclaiming itself to be an Islamic state. Interestingly, several of these nations had been led by women. Megawati Sukarnoputri served as the president of Indonesia, Tansu Ciller as the prime minister of Turkey and Sheikh Hasina and Khaleda Zia as prime ministers of Bangladesh. This is not to suggest that these states do not suffer from their respective set of domestic issues which are a challenge to the kind of secularism being practised in these countries. We’ve been reading about the brutal manner in which many secular and atheist bloggers have been hacked to death in Bangladesh. The word “secularism” was expunged from the preamble to the Bangladeshi constitution during military dictator Ziaur Rahman’s regime, but was thankfully brought back owing to a high court ruling in 2010. Turkish prime minister Recep Tayyip Erdogan is a known Islamist, and the Pancasila philosophy is often criticised in Indonesia courtesy its secular grounding. No country is devoid of religious politics or communal discrimination, but the very reality that secular Muslim majority countries exist should be an eye opener for many. But at the same time, let us also recognise the reality of countries like Saudi Arabia which masquerade as “Islamic states.” The Kingdom of Saudi Arabia (KSA) does not even provide its non-Muslim citizens the right to freely propagate their religion and build their places of worship. How absurd can a state get, especially when it claims to rule under the pretext of Islam? Doesn’t the Quran explicitly mention religious freedom? Of course it does! Chapter 109, Verse 4 of the Quran says, “I have my religion and you have your religion.” Another much quoted verse is Chapter 2, Verse 256 which says, “There is no compulsion in religion.” These two verses from Islam’s most significant religious document clearly hint at how ignorant the Kingdom of Saudi Arabia is regarding the teachings of Islam when it prevents non-Muslims from professing their faith freely and puts to death anyone who converts from Islam to any other religion. One can cite more verses from the Quran to explain how integral the freedom of worship is to Islamic teachings. Chapter 22, Verse 67 of the Quran states, “We have appointed for every community ways of worship to observe. Let them not dispute with you on this matter.” The need to protect religious monuments belonging to non-Muslims as well as Muslims is also mentioned in the Quran in Chapter 22, Verse 40 wherein it is stated, “If god did not repel the aggression of some people by means of others, cloisters and churches and synagogues and mosques, wherein the name of god is much invoked, would surely be destroyed.” And here we have the Kingdom of Saudi Arabia with its redundant apostasy laws and completely un-Islamic ways of not allowing non-Muslims build their religious monuments and worship god in their own prescribed ways. There are several theocracies like Saudi Arabia where such laws are common. In Egypt, Coptic Christians are often targeted and asked to prove their patriotism. This sort of racism was regularly manifested during the reign of the Muslim Brotherhood. Didn’t the members of Muslim Brotherhood hear tales of the Christian delegation which came to meet Prophet Muhammad from Najran? 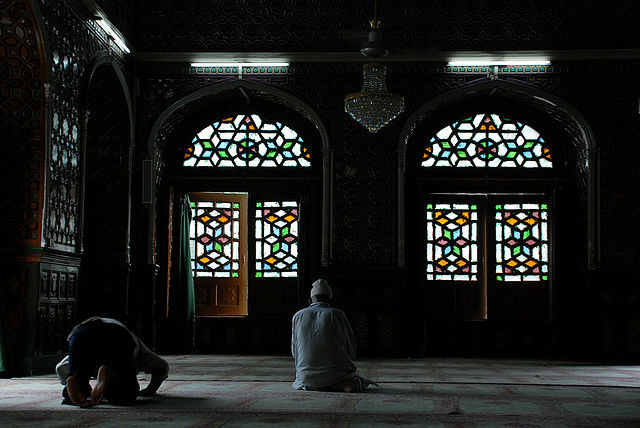 The Prophet didn’t just have a theological debate with them, but allowed them to pray inside Masjid al-Nabwi or the Prophet’s Grand Mosque in Medina. Yet, we had certain elements in Egypt questioning the Coptic Christians’ patriotism simply because of their annual pilgrimage to Bethlehem. They were labelled as being part of a Zionist ploy which is indeed laughable. This kind of an anti-Christian sentiment needs to be shunned. The likes of Ahmadinejad have to recognise the horrors of the holocaust and treatment meted out to the Jews in Germany. Conspiracy theorists have to give up on the preposterous suggestion of US Central Intelligence Agency (CIA)-Mossad involvement in 9/11. We must regret the fact that a terrorist named Osama Bin Laden used Islam’s name to commit an entirely inhumane act on September 11, 2001, which led to the death of thousands. He shall never be forgiven for that because Islam teaches that the death of even a single innocent person is like the death of all humanity (Quran: 5:32). One more thing that is essential to undo the baggage of anti-Semitism rests in understanding that not every Jew is a Zionist sympathiser and not every Jew can be held responsible for the excesses of the Zionist state in Palestine. Lastly, we have our dear neighbour Pakistan where the population of religious minorities has historically been on the decline. Blasphemy laws are utilised to frequently frame non-Muslims and forcible conversions aren’t that rare. Owing to a hostile environment, the Hindu community in Pakistan has steadily shifted base to India which is a matter of great shame for Pakistan. Whether a country is Muslim majority, Christian majority, Buddhist majority, Hindu majority, Jewish majority or atheist majority ruled by communists, it has to realise that freedom of religion and equality of all religions before the law is a must. No person can be deprived of any privileges because of his faith which is a matter of choice. Everyone must be treated equally. Muslim majority countries, in particular, are doing fairly well in some regions but have dreadful laws in places like Saudi Arabia. A thorough revision of the law is a must in such regions to bring non-Muslims at par with Muslims as citizens of a free state. It must also be ensured that minorities within the Muslim community, be it Shias, Sufis or Ahmadiyyas are not discriminated against, labelled as heretics, and recognised as Muslims. More importantly, the rights of women need to be recognised, which is possible only when the state bans female genital mutilation, introduces compulsory girl education, outlaws polygamy and gives women an equal say in matters of divorce, inheritance law and judicial testimony. There are two countries in the Middle East which are being increasingly perceived as powers to reckon with. The first is the Islamic Republic of Iran which has since the days of the Islamic Revolution in 1979 matched up to the might of the United States of America. Ironically, the other country is the tiny nation of Qatar which has brought about a wave of changes in the entire geopolitics of the region by institutionalizing a powerful and autonomous news network besides being brave enough to vouch for hosting the FIFA World Cup in the heat of the Arab land. 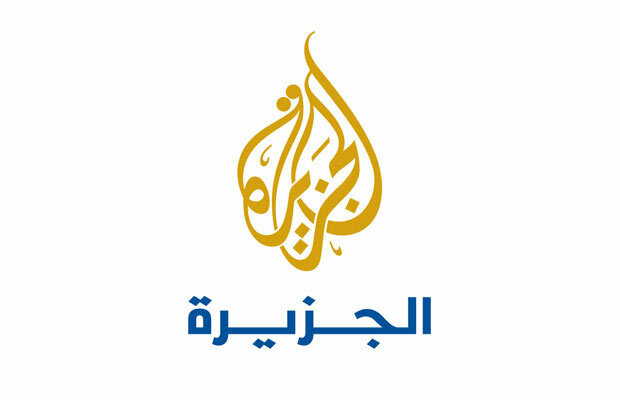 In order to counter the growing influence of the Western Media in regards to the representation of the people living in the Orient, specifically the Arab World, the Emir of Qatar financed the launching of Al Jazeera in the year 1996 following the disputed closure of BBC’s Arab News Channel. Al Jazeera’s claims towards maintaining editorial independence are based on the finer nuances of its funding mechanism. The “Emiri Decree’s” which finance operations at Al Jazeera come by way of loans (like the “500 million Qatari Riyals” granted by the Emir in 1996 to kick-start the network) instead of direct government subsidies. Ideologically speaking, Al Jazeera is generally viewed as a left-of-centre media organization which is more or less critical of the expansionist interventions of the United States in the region of Middle East which happens to be quite a mercenary in terms of mineral and oil wealth. However, domestically Al Jazeera can be termed as a news network which belongs to the liberal school of thought since it has gone out of the way on several occasions and taken up issues which would go usually unnoticed in conservative Muslim-majority societies. Al Jazeera’s reportage of the War in Afghanistan was its first supposed “claim to fame”. During the tumultuous war time, Al Jazeera aired videos of several terrorists including Osama Bin Laden, the mastermind of the 9/11 attacks in the United States. While this lead to heavy criticism of the news network, a plus point of this exercise was that Al Jazeera was applauded as having given an opportunity to both the sides to speak. Al Jazeera’s maverick coverage of war events continued during the extended conflict in Iraq in 2003. As Al Jazeera grabbed several awards at various international media functions, it also expanded its operations by launching Al Jazeera English in November 2006 and Al Jazeera America in January 2013. Coming to the core issue of the legal status of Al Jazeera, a news report published in the Gulf News on 13th July, 2011 reported that Al Jazeera was planning to turn into a “private organisation devoted to public interest” but this spectacle is yet to occur as the Emir of Qatar is still the one who is empowered to call the shots at Al Jazeera as was reflected recently when the News Director of the organization ordered the reediting of a video clip on the Syrian conflict to include the comments of Sheikh Hamad Bin Khalifa al-Thani. In terms of audience reach, Al Jazeera claims to have a firm audience base of 40 million in the Arab World. A research conducted by Allied Media Corp stated that the bulk of Al Jazeera viewers watch the news network for an average of 2-3 hours every day. The research pointed out at the alarming yet misogynistic nature of the Arab society since the male viewers clearly outnumbered the female viewers by a large margin. We can conclude by stating that even though Al Jazeera is brilliantly managed and is quite an exception when scrutinized through the lens of its background and history but it would still have to improve a lot in order to gain greater credibility and acceptance in the West which is possible only if Al Jazeera restraints itself from excessively raking up issues cornering around the twin themes of Pan-Islamism and Pan-Arabism which are the hot favourites of its large audience. 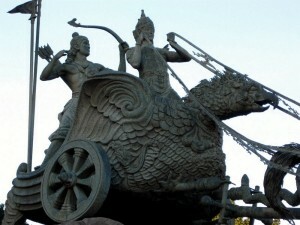 Statue of Krishna and Arjuna at Jakarta Main Square in Indonesia. With the escalation of Hindu-Muslim tension in India, Hindutva ideologues have started to brainwash Indian Hindus by trying to instill in them a sort of existential dilemma. They reason that Islamist Jihad in India will result in a situation where no Hindus will be left to live in Bharat. In order to substantiate their claim, they cite the example of Muslim majority Pakistan and Muslim majority Kashmir. When Pakistan came into being in 1947, the Hindu population of the state ran in double digits (percentage wise) but gradually this figure has descended to a percentage or two. Similarly, the ethnic cleansing of Kashmiri Pandits from the Valley has led to over 90% of the Kashmiri Pandits being forced out of their homes. Islamophobic intellectuals in India have stated that these warnings should not be taken lightly by the Hindus as Muslims are on a mission to convert India into Darul Islam. I wonder whether these academicians really understand the meaning of the term Darul Islam (Abode of Peace) which has been used in the Quran to describe heaven and not some Muslim majority country ruled by the Sharia as some Islamophobes would have us to believe. If there is any person who is worried about the fate of Hindus in Muslim majority countries and intends to know whether the two communities can co-exist in such a situation then that person should look at Indonesia, the country with the highest number of Muslims in the world. According to the 2010 National Census of Indonesia, the island nation’s human force stands at 237.6 million. Muslims form the majority with 87.5% of the population. Christians happen to be the major minority in the country with 9% stake in the population whereas Hindus and Buddhists form 3% and 2% population share, respectively. Indonesia happens to be a secular state and the guiding force behind the idea of Indonesia is the Pancasila. The Constitution of Indonesia was formulated by such secular fundamentalists that in August 1945 they unanimously ratified and agreed upon the usage of the term “Tuhan” instead of “Allah” in the Indonesian Constitution. This was done particularly to strengthen the confidence of minorities like Hindus who preferred using the term “Tuhan” and could connect with it. On the same day ie 18th August, 1945 the constitution makers modified the first principle of the Pancasila from “Belief in Almighty Good with the obligation for its Muslim adherents to carry out the Islamic Law” to “Belief in Almighty Good”. This made the Indonesian Constitution all the more secular. Garuda Pancasila is the National Emblem of Indonesia. It has been inspired by the Hindu mythological bird, Garuda. The official motto of Indonesia is “”Bhinneka Tunggal Ika” which can be translated as “Unity in Diversity”. The term unity and diversity is said to have been originally coined by Bahai Ullah, the founder of Bahai Faith. 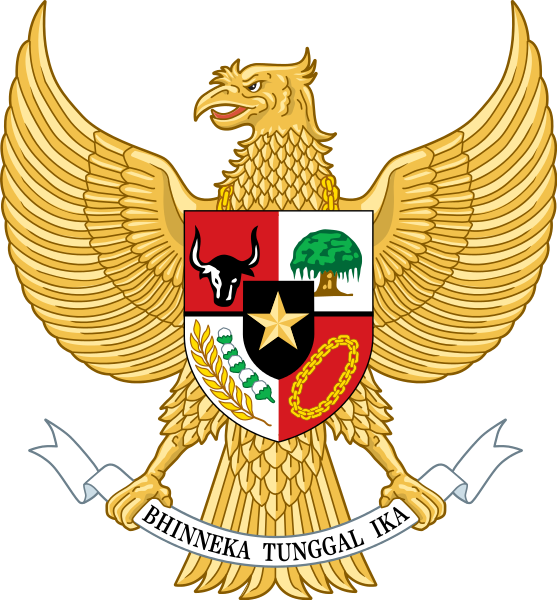 The national emblem of Indonesia is called Garuda Pancasila. In Hindu mythology, Garuda is a bird of great significance as it is the vehicle of Lord Vishnu. One of the most important Hindu scriptures called Garuda Purana describes the conversation between Lord Vishnu and Garuda regarding afterlife. Garuda Purana is also recited in Hindu households after someone passes away. Indonesia’s national airline has also been influenced by this bird of Hindu mythology and is called Garuda Indonesia. Lord Ram’s beloved “Hanuman” who appears in the Ramayana is the official mascot of Indonesia’s military intelligence. The National flag of Indonesia called the “Sang Saka Merah-Putin” (meaning “The Sacred Red and White”) has been influenced by the banner of Majapahit empire which was at the time of 13th century one of the largest empires of the region. Hinduism and Buddhism were the dominant religions in the Majapahit Empire. Inscription of Lord Ganesh on an Indonesian currency note. Senior BJP leader and Former Deputy Prime Minister of India, Lal Krishna Advani visited Indonesia in July 2010 to attend the World Sindhi Conference in Jakarta. It is noteworthy to mention that Advani used to be the poster boy of Hindutva in India as it was him who headlined the Ram Janmabhoomi movement and ensured the rise of Hindu nationalism in the country. During his trip, Advani was left awestruck because of the pride bestowed upon Hinduism by Muslim majority Indonesia. On his return to India, he wrote a blog titled “Hindu influence in Indonesia” on 17th July, 2010. He concluded that write up with the following words, “Indonesia, I must say, seemed to know and cherish Ramayana and Mahabharata better than we (Indians) do.” Advani mentioned in his blog about the Ganesh inscription on a high denomination currency note of Indonesia ie 20,000 rupiah. The official logo of the island of Bali in Indonesia represents the Three Gods of the Universe ie Brahma, Vishnu and Shiv. 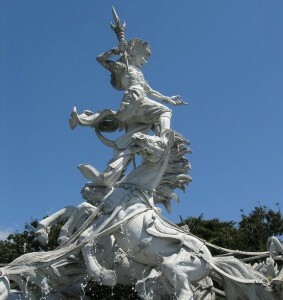 Statue of Ghatotkach in Indonesia. The driver’s answer won Advani’s heart. Advani wrote, “Indeed, even in India very few would be able to identify who Ghatotkach is. And here was the driver of our car knowing full well both Ghatotkach as well as his relationship with Bheema.” Indonesia’s pluralism and its respect for the various religious traditions being practised in the country is a matter of great pride for the entire world. The world’s largest Muslim majority country stands as a testimony for those who believe that societies which are dominated by Islam do not even exhibit the slightest form of tolerance. Advani’s respect for Indonesia stems from Indonesia’s respect for Hinduism. We hope and pray to God that Indonesia continues to prosper and remains a citadel of peace and tolerance across the globe. Advani stated in his blog, “In Indonesia, the names of places, of people, and the nomenclature of institutions also give one a clear impression of a benign Sanskrit influence.” We hope that this vibrancy of Indonesian culture never ceases and continues its existence till eternity. The practise of iconoclasm is one of the most striking features of hardline Islamism. 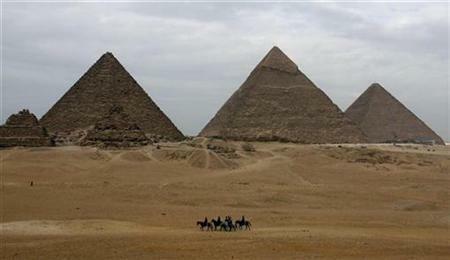 An Egyptian Salafi Sheik by the name of Murgan Salem believes that it is necessary for the Egyptian Government to destroy all the pyramids, statues of ancient pharaohs and all other antiquities which are generally associated with universal heritage. The reasoning which this Sheikh renders is that this move will help in curbing idolatry and in destroying the remnants of Paganism in Islamic Egypt. Murgan Salem also justifies the sacrilegious act of destruction of the Great Buddha Statue in Afghanistan by Islamist militants. He believes that by destroying the statue, the Islamists did great service to Allah and Islam because this statue was held in high reverence and worshipped by 800 million Buddhists based in different parts of the world. Since the statue has now been destroyed, people would no longer be able to insult Allah by worshipping objects other than him. It’s indeed a tragedy that Islamists view Prophet Muhammad’s cleansing of the Kaaba as an act of unilateral iconoclasm and choose to disregard the Quranic commandment of safeguarding churches, synagogues, mosques, cloisters and all those places where God’s name is invoked (22:39). The practise of Islamism has a deep connect with the history of Muslim civilization. When the Muslim armies were shuttling between the three continents of Asia, Africa and Europe; countless places of worship were razed to the ground as a result of Islamic zealotry. The worst sufferer was possibly the Indian Civilization which saw wide scale destruction of its temples by plunderers like Mahmud of Ghazni who desecrated temples and carried away all the wealth to develop his own kingdom and to utilize the loot money to sponsor raids against fellow Muslim kingdoms. The world has come a long way since then with the enactment of universal human rights and other revolutionary measures promoting egalitarianism but what continues to bind Islamism and iconoclasm are history books which are written with such bias that they carry on with their praise of desecrators. The challenge before the Islamic civilization lies in accepting the misdeeds of its forefathers. At the turn of millennium, even the Vatican issued an apology regarding the dastardly acts which the Church carried out in the name of Christ. The secular activists in the Arab world have to take up the mantle of taming the hateful ideology of men like Murgan Salem and others who want to destroy heterogeneous character of the world and replace it with a sickening and radicalized interpretation of the Sharia where religion is more of a curse than blessing.